Having the right tool at the right time can be a lifesaver. 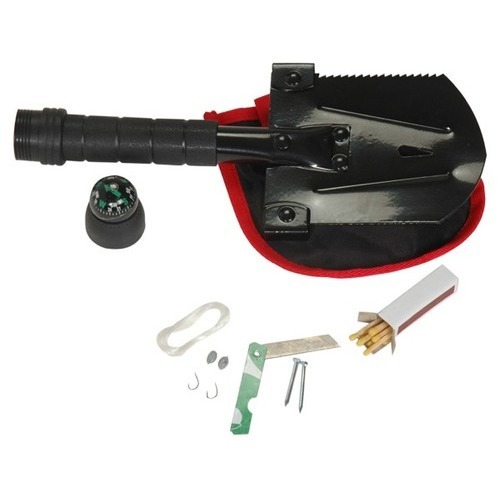 The Compact Multi-Function Shovel is perfect for certain emergency situations. 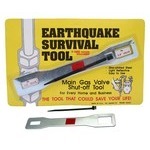 One end has numerous tools and functions and the handle contains additional survival gear. Prepare your home or auto for unplanned events. Dimensions 12" x 4.5" x 1"
This lightweight tool has a nail puller, hatchet edge, saw edge, hammer, wrench with 3 different sizes, and a bottle opener. A water filled compass is located at the bottom of the handle. The compass can be unscrewed revealing a waterproof container. Inside the waterproof container you will find a box of matches, 2 nails, a sharp razor blade, fishing line, bobbers, and hooks. This is a great tool to keep handy in survival kits or in the car.